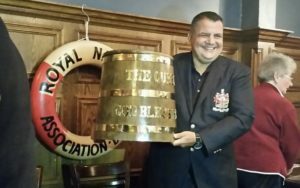 The Royal Society of St. George (Bolton Branch) have kindly donated a full size oak and brass ‘Grog Tub’ and distribution ‘Rum Fanny’. Pictured here is Chris Houghton, RSSG (Bolton) Chairman presenting the tub to members during the monthly meeting. We now await an appropriate time and place to christen the tub in full style!